A quality security chain, the 450 series features hardened steel square links with extra strong welds offering a high level of resistance to cropping and sawing. 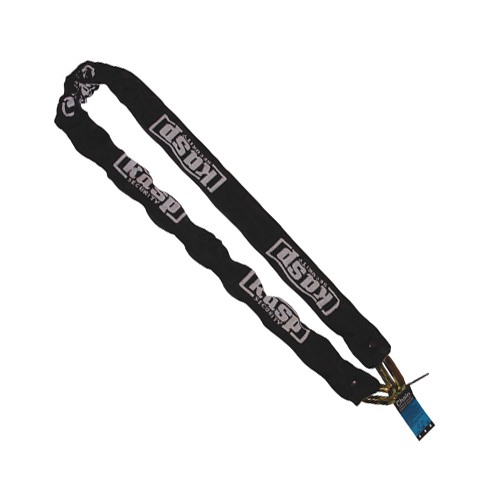 Encased in a durable fabric, reassuringly embroidered with the Kasp® logo, the 450 series cuts no corners when it comes to security. Hardened square section chain links - Extra resistance to attack from bolt cutters and hacksawing. Fully welded links - Extra strong resistance to pull and torsion attacks. Fully galvenised finish - Extra resistance to corrosion. Durable fabric sleeve, permenently attached - Protects paintwork from accidental damage.